If you are going to play Advanced Fantasy Baseball you will need to stay current with prospects and future prospects. Baseball America is an excellent source of information on minor leaguers, college players, high school players, independent leagues, and the winter leagues. Although they keep most of their material behind the subscription wall there is always very useful information available for free. One useful free resource is their Baseball America Prospect Report. This is a FREE daily e-mail that updates you on the performances of players in the minors. It also keeps up with the players participating in Winter Leagues so it should be useful if you, like me, are too poor to journey to Arizona every Fall. The Prospect Hot Sheet is Baseball America's weekly update on who the hottest minor leaguers are. This week for the last week of the report for the season they shared their Top 20 Standout Prospects from the 2009 season. I'm reproducing the list but you'll have to visit the link to read their comments and see the stats these guys put up this year. Any comments are all mine. 1. 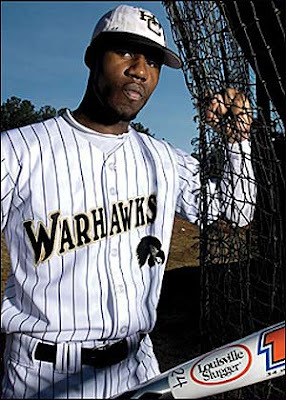 Jason Heyward RF Atlanta Braves - Almost universally considered the best prospect in the game. He should begin a long reign as the Braves best player in 2010. 2. Buster Posey C San Francisco Giants - The Giants have an under-hyped group of position players that will certainly help them upgrade their offense. Posey leads that pack and could be starting for the Giants in 2010. 3. Chris Carter 1B Oakland Athletics - The next Jason Giambi may be in the Oakland clubhouse in 2o10. Though the A's may want to give him a bit more time at AAA to work on cutting down those strikeouts. 4. Brian Matusz LHP Baltimore Orioles - The leader of an impressive crop of Orioles pitching prospects. He's already turning heads in the majors. 5. Desmond Jennings CF Tampa Bay Rays - Jennings is a personal favorite of mine. I love his combination of speed on the base paths and power potential. He is the only minor leaguer this season with more than 50 stolen bases and 50 extra-base hits. 6. Carlos Santana C Cleveland Indians - Santana looks ready to replace Victor Martinez in the Indians' lineup. He's not quite in Martinez's class as a hitter (not yet anyway) but he should be a very good fantasy option. 7. Derek Norris C Washington Nationals - The catcher of the future in Washington. Jesus Flores has the power but he does not have the skills that Norris displayed this season. 8. Christian Friedrich LHP Colorado Rockies - As a Rockies pitcher and a rookie he won't qualify for the Short List but his stuff is incredible. 9. Madison Bumgarner LHP San Francisco Giants - Another great pitching prospect for the Giants. He might be the left-handed Tim Lincecum if he can develop a complement to his great fastball. 10. Jeremy Hellickson RHP Tampa Bay Rays - Hellickson would probably already be dominating in the majors if he were not in an organization busting at the seams with pitching talent. 11. Jaff Decker LF San Diego Padres - This is the patient and power-hitting outfielder the Padres so desperately need. 12. Jesus Montero C New York Yankees - He broke a finger in August which probably cost him a September call-up. He could be the Yankees' next DH if he moves away from catching as most suspect he will. 13. Daniel Hudson RHP Chicago White Sox - Played at four different levels this season before finishing in the major league bullpen. He could be in the big league rotation next season. 14. Pedro Alvarez 3B Pittsburgh Pirates -He represents hope for Pirates fans. He was worth all the trouble the organization went through to sign his powerful bat even if it ends up at first base. 15. James Darnell 3B San Diego Padres - The Padres have a nice group of patient hitters in the pipelines. They may know what they're doing after all. 16. Thomas Neal LF San Francisco Giants - He played in High A at 22-years old but should be promoted quickly up the ladder next season. 17. Martin Perez LHP Texas Rangers - Perez is currently my favorite pitching prospect. The Rangers are on a role when it comes to developing pitchers and Perez will have the chance to establish himself as in the same class as Derek Holland and Neftali Feliz next season. 18. Ike Davis 1B New York Mets - Davis has serious power but has some work to do on his plate discipline. 19. Michael Taylor RF Philadelphia Phillies - Taylor could be proof that the Phillies are about to go on a run of success never before seen by a Philly baseball team. He has all the tools and produced big-time numbers this season. 20. Tyler Flowers C Chicago White Sox - He was a standout in the Arizona Fall League last year and produced like a future standout fantasy catcher this year. Under Not Fantasy Sports but Still Awesome! Dan Brown, author of the Di Vinci Code and Angels and Demons, has a new book coming out called The Lost Symbol. The new book also features the historian detective, Robert Langdon. Dan Brown writes books that are almost impossible to put down. Everyone you know will be talking about it very soon. The even greater news is that Amazon is offering an insane discount on the book right off the bat. You can get the Hardcover edition for just $16.17 which is 46 percent off the cover price. If you buy through one of my Amazon links you'll also be helping out Advanced Fantasy Baseball. In fact, if you buy stuff from Amazon.com you can always do so through the portals on this site and help me out while doing your shopping as usual. I like Jaff Decker and loved how you wrote up the origin of his name in your article. Just wondering, why not use an actual name rather than that string of crazy digits?